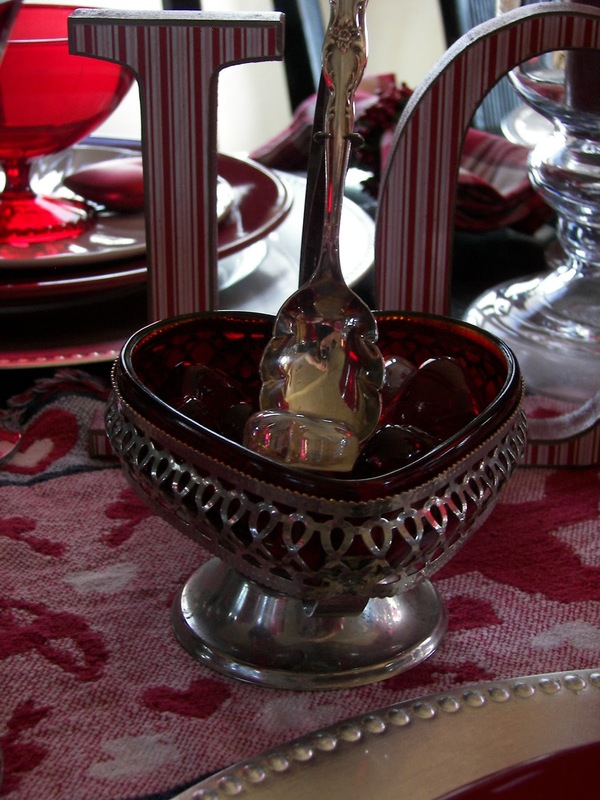 Welcome to my LOVE tablescape and to Tablescape Thursday! February is the month of Love; it is the month I was married in. 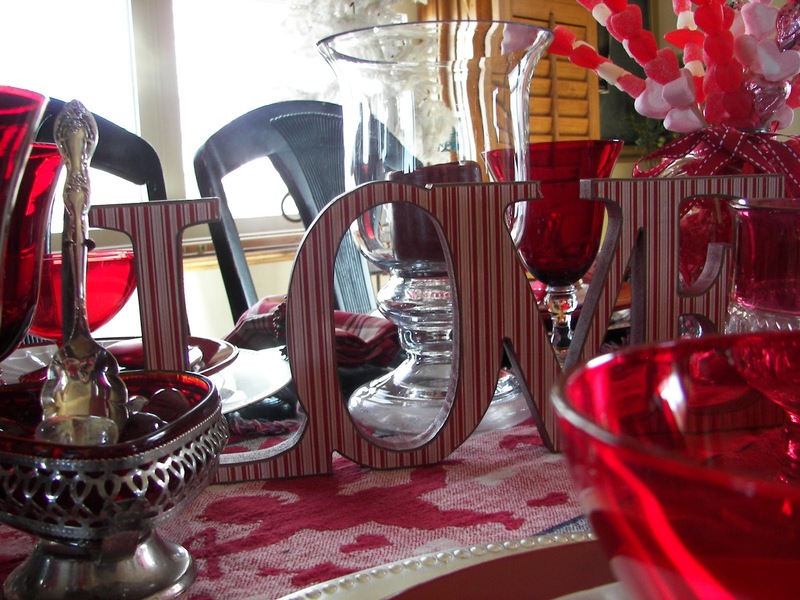 At our wedding reception, we decorated in true Valentine colors of red and white. The highlight of our wedding reception were the white painted manzanita trees with white lights and red hearts. My One Year Blogging Anniversary -- the date I made my first post -- is tomorrow! I have put together 48 Tablescapes in this past year! I have also enjoyed looking at all of YOUR tablescapes -- you have inspired me! Make sure you drop by tomorrow -- I will be having a great giveaway to celebrate my First Blogging Anniversary! As you view my "Love is in the Air" Tablescape, I want to share with you a few random things that I am thinking about that I LOVE. I love cats, but I am afraid of dogs. Well, I do like Lucy, my nephew Mack's dog. Any cat that shows up at my doorstep will get fed. I love our own Wolfay and MoMo. I love decorating with candy. It is so bright, fun, and happy. I made this candy skewer centerpiece over a week ago and it is still intact -- sometimes you can train your family! I love words and I love reading, especially children's and young adult literature. Someday I would like to compete in the Senior Spelling Bee held in Cheyenne, Wyoming. I did compete in spelling bees when I was younger; I will always remember how to spell the word eczema -- the word I missed. My 10-year old daughter, Talley, just competed at her school spelling bee; she won for the 4th grade; I liked helping her study. I love piano music. I did take lessons but was not a very good piano player -- it might have had something to do with the amount I practiced. I love hearing my children play the piano, especially at Christmas and when they play church hymns or their recital pieces. I am so happy to be able to provide them with piano lessons. I love my children; I love how they broaden my horizons and keep life sooo interesting. Would you like some jam? I love backrubs; my husband usually gives me one every night! I love my husband! We will celebrate our 23rd Anniversary later this month. I will use the old cliche that it "just seemed like yesterday!" A view of the glasses. I love blogging and I love the people who blog. Is there a nicer, more supportive group of people? I think not! Tomorrow is the One Year Anniversary of my first post. Stop by for a great giveaway! Valentine Table Runner: Ross many years ago. Silver Chargers: Targetmany years ago. Glass Candleholder-- My daughter Tatianna gave it to me for Christmas this year. 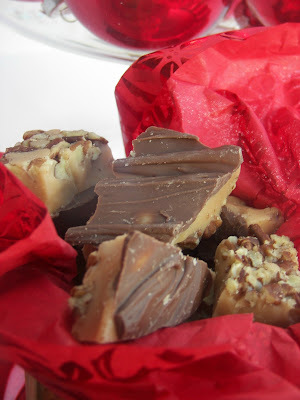 Thank you for stopping by Red Couch Recipes! Wow, Joni, it's hard to believe you've only been blogging a year! You seem like such a veteran! Great table -- the photo labeled "napkin view" is my favorite. The candy centerpiece is really clever! Joni - the table is beautiful and puts mine to shame.. but right now I'm drooling over those heart shaped lintzer cookies in your header.. do you have a recipe for those? YUM. Congratulations on one year!!! Congratulations on your anniversary!!! congratulations on a terrific table!!! I love the jam holder.. how precious to be able to enjoy that now. Your glasses are wonderful. both of them. The plates and ice cream dishes look wonderful on the silver chargers. That your centerpiece is still together.. amazing.. Thanks for dropping in with your kind comments. Happy Valentine's... I'll be back! Congratulations on your first anniversary of blogging, Joni! Beautiful table and congratulations to your daughter winning her spelling bee! Congrats! My mom has those goblet/glasses! It brings back fond memories. We use them at Christmas every year! Happy Anniversary both for your blog and your marriage. I really like the red heart bowl. Congrats on your one year anniversary! Love your pretty table Joni. The candy skewers are really cute. Will come back by tomorrow. And I LOVE... this table. Actually, I always love your tables. They are always so festive, and this one is no exception. I could pick up the whole thing and put it right in my kitchen! Congratulations on BOTH anniversaries. I can't believe you have done 48 tablescapes in a year, and you still have fresh ideas and creativity every time. You have had a terrific year of blogging and are one of my favorite stops! Love this table! Happy Valentine's day! That candy centerpiece is fantastic...and the fact that it survived is even more fantastic!!! Love your beautiful table setting!!! Happy almost blogaversary. This is so beautiful -- the love in the air landed right on your table! How pretty your "jam server" is. I love your table of love. Hi and congratulations on your one year bloggaversary! Now your table is gorgeous!! Valentine perfect! Happy Anniversary on both counts!!! "Seems like yesterday" is apropos, I'm sure as time flies when you're having fun! Adn congrats on getting your family to back off the candy centerpiece! That's quite a coup! P.S. Congrats on 1 year! Happy Blog and Wedding anniversaries! (I love that you did your wedding decor in true V colours and theme! )Your tablescape is so pretty, love the dishes, napkins and goblets! Hello, I found you today through BNOTP and I'm glad I did! 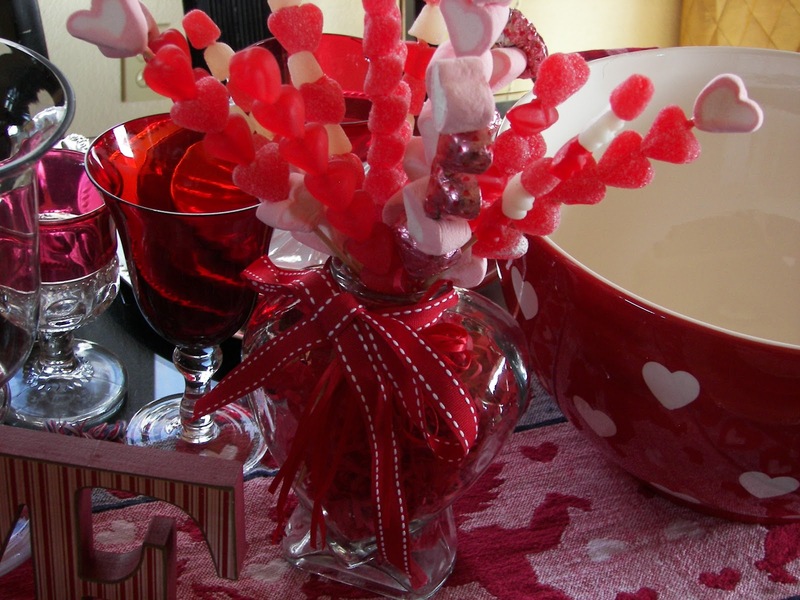 Decorating with candy would be very dangerous around me, but I'm loving your candy centerpiece and I'm thinking it would be a fun project with my granddaughter! Congratulations on your marriage anniversay and your blogging one!!! Happy Anniversary Joni and happy blogging anniversary too! Congratulations on both anniversaries and thank you for getting me into blogging too, even though you had to force me, dragging my feet and kicking! I apologize for I love it too and I love all of the wonderful women (and men) that we have met. What a great table. All of the reds just make my heart sing. I have come to just adore red, it is such a treat for the eyes. All of your fun touches are gorgeous. The runner is so fun and the jam bowl is incredible. Hope you have a wonderful anniversary tomorrow and the next day too. Such great energy in this one! 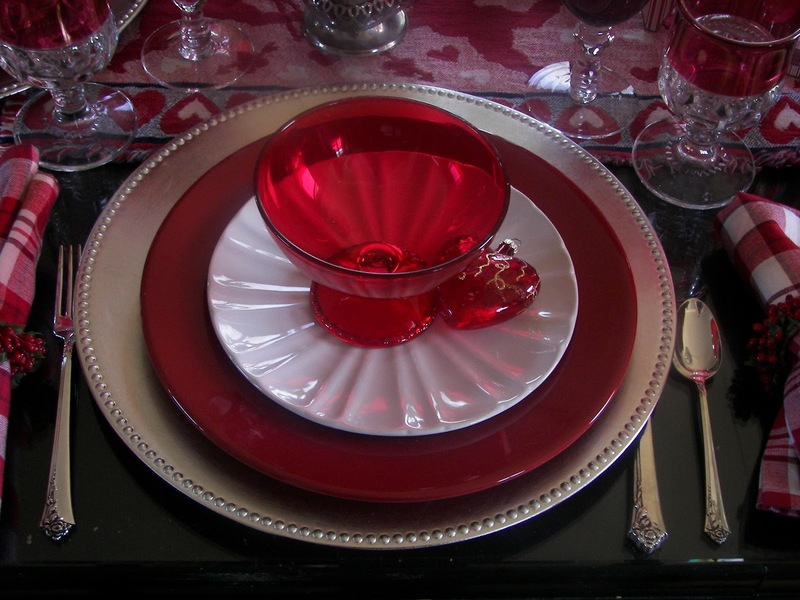 Love the King's Crown goblets (such a lovely gift from your sister), and your mother's heart-shaped dish is wonderful! Beautiful table, Joni, and that is ♥felt! I loved Spelling Bees too, still have the medals I won. Son followed in my steps and won many too. He missed on manse. We are Catholic so we call it a rectory! He never heard of it, but will always remember! I taught 4th grade for most of my 33 yrs of teaching, lots of spelling bees! Had to tell the gal in Pottery Barn receive was wrong on the sale board. So many people can't spell! They depend on spell check, LOL. very pretty table, love the skewers!! Congrats on your anniversary...from a NON speller. amen for spellcheck! 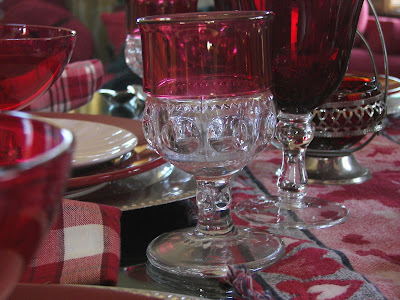 Lovely silver, amazing goblets, pretty red plates - what a gorgeous table! I am amazed at how many tablescapes you have put together in 1 year! You have lots of creativity (and dishes) to be able to do that. :-) Congrats on your blogoversary, Joni! You have put together and maintained a very, very nice blog and I'm so glad you're part of the blogging community. I love the rich dark red colors. Just beautiful! Hi Joni! Congrats on one year!! I am excited to see what you come up with next. I recreated your bouquet on my blog and credited it back to you. Thanks for the inspiration and all you do!! Here is the link. 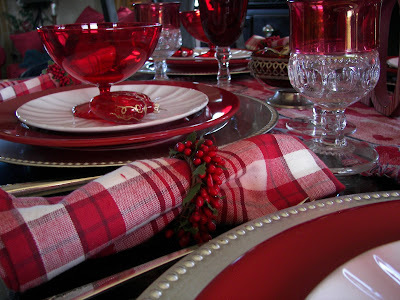 Love all the red ~ my favorite color! The jam dish is just gorgeous...actually, all of the dishes & decor are. Congratulations on both anniversaries ~ enjoy! Congratulations on one year! Bloggers are truly the best! And Happy Anniversary to you and your hubby. I love the jam holder, and your tablescape is just so romantic. I'll pop back in tomorrow. Congratulations on your first year of blogging! I've really enjoyed reading your posts and recipes throughout the last year! Here's to another year of fabulous blogging! Btw,I ADORE the heart shaped jam dish! p.s. You should totally compete in the senior spelling bee, lol! Hi Joni! Congratulations on your one year Anniversary! Your Valentine table is just precious! I especially love the jam bowl. So pretty! Joni, WOW!! w hat a beautiful table. Comgrats with your one year at blog land and Happy Anniversary to you...you're right at Love Season to enjoy it with your hubby. I had so much fun looking at this blog, love the heart shaped dish from mom and your sister's goblets. 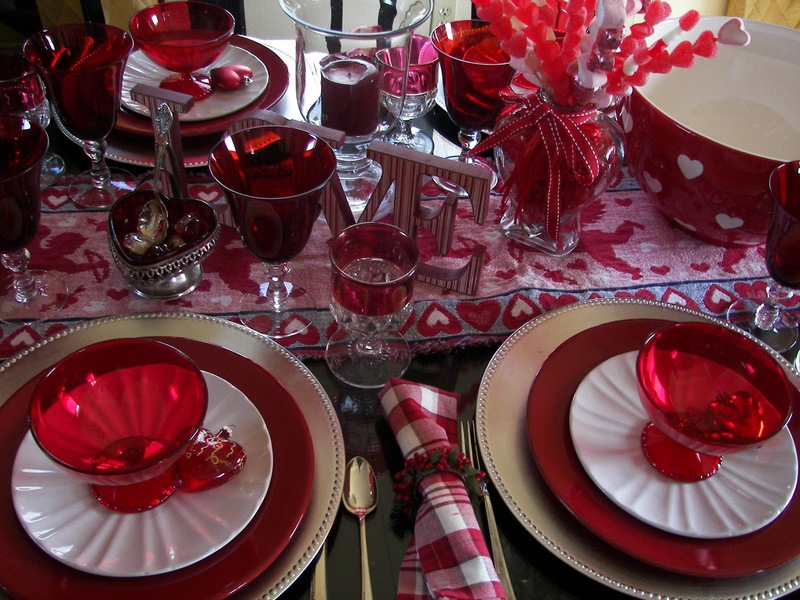 All of your red glass is just gorgeous!Your table just epitomizes valentine's day. Love all of your lovng narration!! 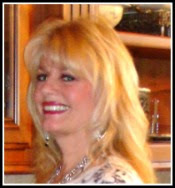 Thank you for stopping by my blog...I am soooo late in making my rounds for TT. LOVE this table and used the same little red Walmart ice cream bowls too!